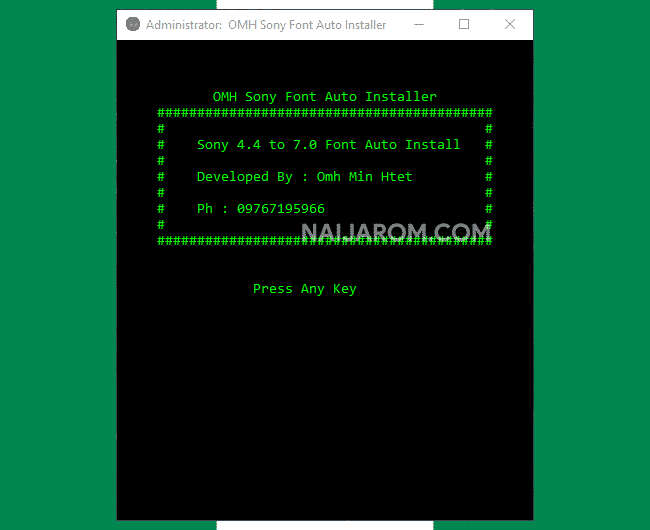 OMH Sony Font Auto Installer is a small application for windows computer which allows you to install the Sony Xperia Fonts on almost any Android Device in the world. It supports installing the Xperia Fonts on devices running on Android 4.4 to Android 7.0. It requires to have the root access in order to install the Xperia Fonts on your Android Device. If in case your device is having the Root Access and you wants to try the Xperia Fonts on your Android Device, install the ADB Driver on your computer and connect your Android Device to the computer with USB Debugging enabled. Once your device is connected to the computer, tool will automatically detect the Android version and CPU type and install the Xperia Fonts in few seconds only. [*] Credits: OMH Sony Font Auto Installer is created and distributed by OMH Min Htet (developer). So, full credits goes to OMH Min Htet (developer) for sharing the tool for free.